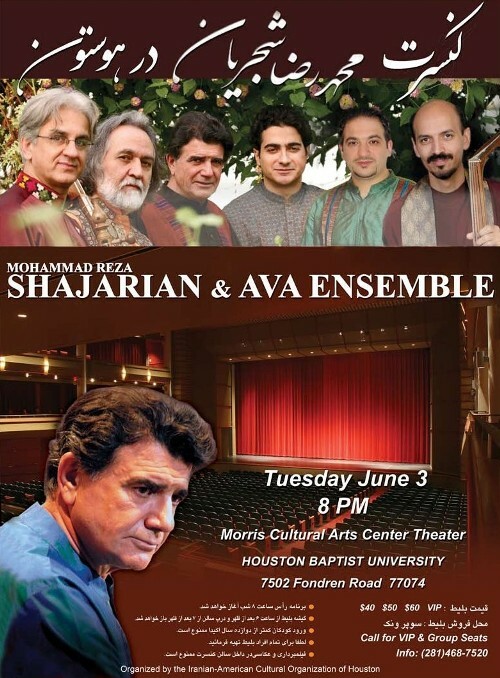 Mohammad Reza Shajarian, Homayoun Shajarian and Ava Ensemble have added the city of Houston to their Concert Tour of the United States and Canada. The Houston concert is scheduled for Tuesday June 3, 2008 at Morris Cultural Arts Center Theater of Houston Baptist University. This program is co-sponsored by the Iranian-American Cultural Organization of Houston and Seattle World Music Institute. For more information contact Dr. Amir Nayebpour at (713)213-4500 or email Nayeb@stthom.edu. For detailed program visit here. About: Mohammad Reza Shajarian is one of Iran's most celebrated vocalists and the undisputed master of Persian classical singing. With his flawless technique and powerful and strongly emotional singing, he is widely considered the embodiment of the perfect vocalist and a major source of inspiration to other musicians. Since rising to prominence in the 1960s, he has had an illustrious career which includes performances at the world's most prestigious venues. In recent years, he performed throughout North America and Europe as a member of the acclaimed Masters of Persian Music touring group. In this program, Shajarian will be joined by his son Homayoun Shajarian on vocals and tombak and Ensemble Ava on barbat (short-necked lute), tar (long-necked lute), kamancheh (spike fiddle), and percussion.